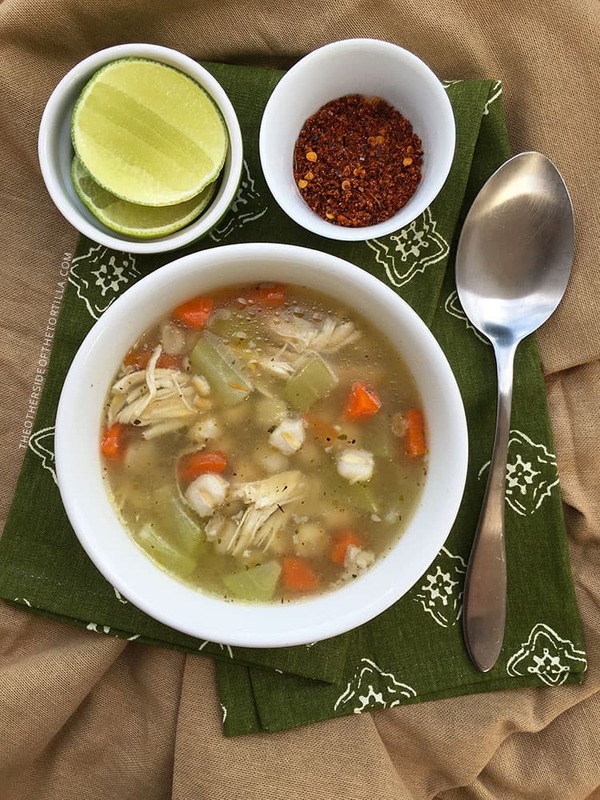 This recipe is my own personal spin on this classic Mexican sopa de pollo with two changes to make it a heartier soup: I’ve added chayote in place of celery (because my husband hates celery) and hominy to give the soup more substantial body so it’s filling enough to be eaten as a meal. The hominy has a nutty and slightly sweet flavor that balances well with the nutty barley, Mexican oregano, and savory broth. Hominy would also be great added to soups like sopa de poro y papa (a broth soup flavored with leeks and potato) or a tomato chipotle broth to give it more substance. I always garnish this Mexican chicken soup with a fresh squeeze of lime juice and chile powder for a little kick, such as ground chile piquin, ground chile ancho, Tajín Sazón (which is meant especially for sprinkling into soups) or regular Tajín. If you like your chicken soup to be a bit more herby, you can add more Mexican oregano. I was a bit conservative with the amount I added so as not to overpower the rest of the flavors. But you do want to be sure to use Mexican oregano and not the traditional Mediterranean oregano that you typically can find in the grocery store. Mediterranean oregano that is also sometimes known as Italian, Turkish or Greek oregano, is sweeter and not interchangeable in Mexican cooking. Mexican oregano has a distinct, robust flavor with a more floral aroma and citrusy notes that enhance the flavor of chiles — which is why this dish is garnished with chile power or Tajín. I’ve used a pressure cooker to cut down the time it takes to make this soup so you can make it from start to finish and serve in less than an hour; if you don’t have a pressure cooker, you can cook it in a regular stock pot on the stovetop and increase the cooking time by about 30 minutes. Reserve the chayote and hominy for the last 15 minutes of cooking so they don’t get mushy. 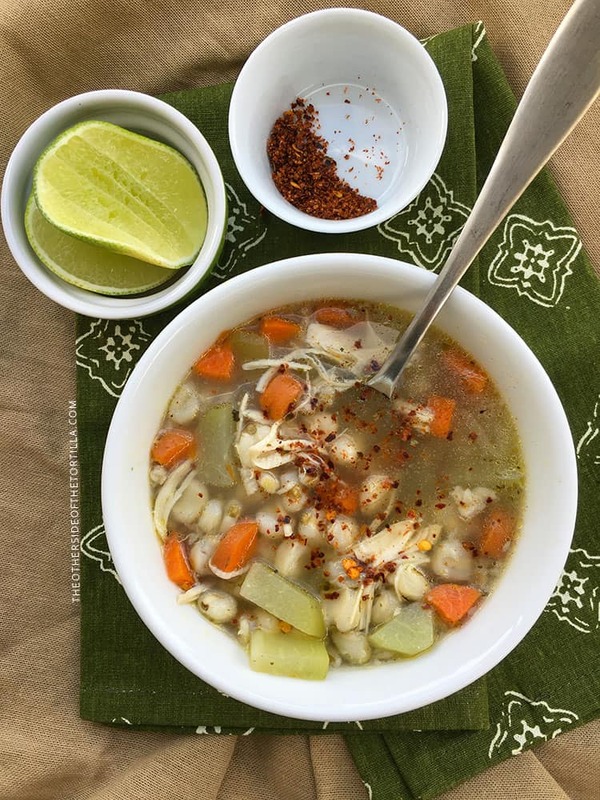 Make this hearty Mexican sopa de pollo with carrots, onion, Mexican oregano, chayote, hominy, barley and finish the flavor with lime juice and a sprinkle of chile powder! Mexican chicken soup for everyone! In a pressure cooker (or stock pot), add chicken breasts, 8 cups water and sprinkle with 1/2 teaspoon of kosher salt. Rinse 1/2 cup pearl barley in a colander under cool water and add to the pot. Seal the pressure cooker and bring to a boil over high heat until the safety seal lock engages (about 5 minutes), then reduce to medium heat until the pressure gauge gently rocks to let steam escape. Cook for 15 minutes, then remove from heat, allow steam to escape to disengage the safety lock, and open the pot carefully with potholders, opening the lid facing away from you. Add 1 1/2 tablespoons Knorr Suiza powdered chicken buillon, 1/4 teaspoon Mexican oregano, 1 garlic clove, one 1/4-inch thick slice of white onion and the diced carrot to the pot. Seal the pressure cooker back up, bring to a boil over high heat to engage the safety lock, turn down to medium heat, and cook for another 15 minutes. While you wait, skin and dice the chayote and set aside. Measure 1 1/2 cups hominy and also set aside. Remove from heat and allow the steam to escape to disengage the safety lock again. Open the pressure cooker with potholders, with the lid facing away from you. Add the chayote and hominy and seal the pressure cooker and cook on medium-high heat for another 10 minutes. Remove from heat, allow steam to escape to disengage the safety lock, and open the lid with potholders, with the lid facing away from you as you open. Remove the chicken breasts with a slotted spoon and transfer to a cutting board. Use forks to shred the chicken, discard the bones and return the shredded chicken to the soup. Serve immediately with fresh limes to squeeze into the soup and optional chile powder. To make this recipe on the stovetop in a normal stockpot, add all ingredients except the carrot, chayote and hominy, to the pot. Bring to a boil, then reduce to medium heat for 40-45 minutes, add the diced carrot and cook for another 10 minutes, then add the chayote and hominy, turn the heat to medium-low and cook for another 10-15 minutes. Looks so delicious! The mexican chicken soup is always great, thanks for your sharing! I love chayote in soup but I never think about adding it. Yum! Suggestion for alternatives to the powdered buillon? Maybe chicken stock? I prefer not to use cubed/powdered bouillon. Laura, you can try a chicken stock or bone broth instead if you don’t want to use bouillon. Knorr now has a product called Knorr Selects that is a natural chicken bouillon made with natural chicken stock (no artificial flavors, colors, preservatives or MSG) and I know it’s available in grocery stores and online if you want to give that a try!